Last year's Recipes for Love and Murder from South African author Sally Andrew set a very high standard, introducing a culture that was entirely foreign to me. South Africa mixes so many cultures, Dutch, German, British, Greek and of course the myriad of native African languages and cultures. Tannie Maria is an Afrikaner woman of a "certain age", widowed, who writes a combination advice and recipe column for her local newspaper. It was disclosed in the first book that Tannie Maria suffered years of violent abuse at the hands of her late husband, Fanie. The Satanic Mechanic begins with the court victory of the area Bushmen tribe over two large corporations, one agribusiness, and one diamond mining. The Bushmen have regained control over their ancestral lands which the corporations have controlled and exploited for decades. The leader of the Bushmen, Slimkat Kabbo, had received death threats prior to the case but everyone hopes that they were just that, threats that will disappear with the end of the case. Slimkat is not afraid and attends a food festival where he is poisoned and dies, despite police protection. Tannie Maria is on the spot, along with her new boyfriend, Detective Lieutenant Henk Kannemeyer. Henk is involved as he is one of the policemen detailed to protect Slimkat. A secondary plot concerns Tannie Maria's grappling with her inability to take her relationship with Henk to a more physical level. It's clear that her years with Fanie have left her with PTSD and there may be more to his death than meets the eye. After consultations with two "experts", one who prescribes diet pills and the other, anti-depressants, Tannie Maria also hears about an informal therapy group dealing with PTSD, led by the "Satanic Mechanic". He was a Satanist at one point in his life but has renounced those beliefs and is trying to do good instead. He is also an excellent mechanic. The group is a diverse one with a mixture of people and economic statuses. 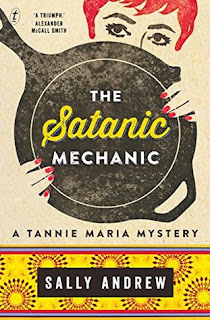 The Satanic Mechanic is helping Tannie but she is still having flashbacks and hallucinations.She also has a very big secret. When another murder occurs, the murder of one of the group members, it is clear that one member has a secret worth killing for. On its face, The Satanic Mechanic might be a very dark and depressing story. Instead, Sally Andrew has filled it with good humor, quirky characters and above all, mouth-watering descriptions of the food that Tannie Maria makes. Food is something that Tannie Maria loves and excels at. Thankfully, Andrew provides recipes at the end of the book. Under the category of quirky, I have to mention that a Police Detective with a pet lamb is OK with me! I could wish that she had included a glossary as she did at the end of Recipes for Love and Murder. Perhaps there will be a glossary included with the print version, available in the US early in 2017. The book itself is very topical, looking at the dark history of racial tensions in South Africa and the reverberations of violence even years after the events. It ends, however, on a very hopeful note. I highly recommend The Satanic Mechanic and its predecessor, Recipes for Love and Murder.